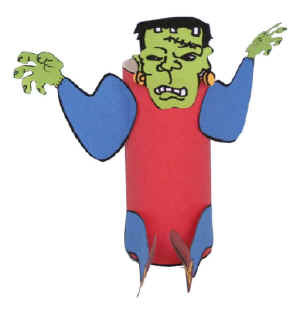 This is a fun color, cut and paste paper craft that uses a toilet paper roll as a base to create a three dimensional Frankenstein to display or play with. The "In the Graveyard" song is a great tune to go with this craft! Print out the craft template of choice (color or black & white). Colour the pieces, as necessary - Frankenstein is often shown with green skin but you can get imaginative. Wrap the large rectangular template piece around the cardboard tube. Glue the monster's head, arms and legs onto the body.